A Turkish expatriate living in Germany has been detained in his hometown of Afyonkarahisar on charges of insulting Turkish President Recep Tayyip Erdoğan and Mustafa Kemal Atatürk, the nation’s founder, the Hurriyet daily reported on Wednesday. B.A. 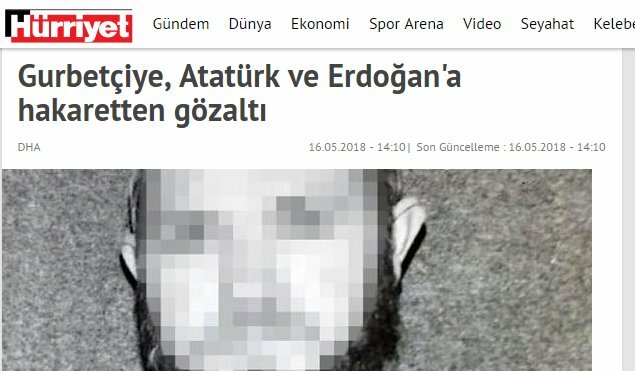 allegedly insulted Erdoğan and Atatürk on social media. The man was detained by gendarmes last Thursday, and t24 said B.A. was later released but that a travel ban was imposed on him, meaning that he will not be able to travel to Germany, where he resides. Hundreds of people in Turkey including high school students face charges of insulting President Erdoğan. Even the slightest criticism is considered insult, and there has been a rise in the number of cases in which people inform on others claiming that they insulted the president, the government or government officials.